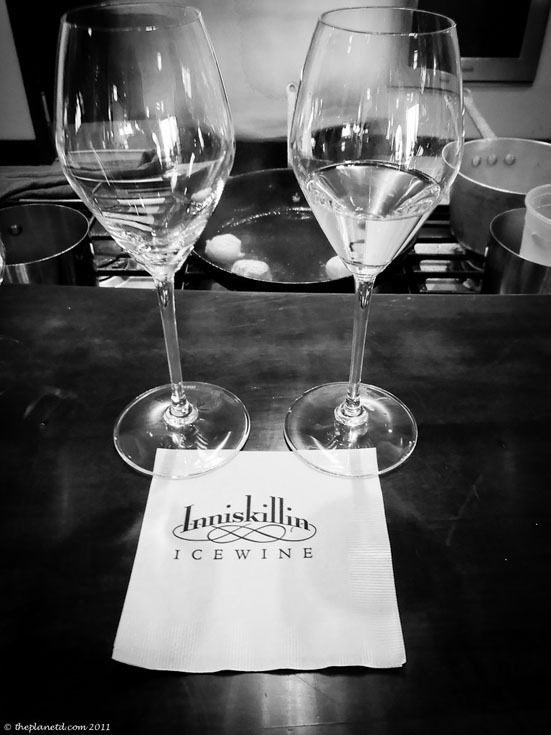 I admit I wasn't a fan of ice wine, and while Pam of Spunky Girl Monologues tried to sell me on the idea that I was going to love the Ice Wines of Inniskillin, I had my doubts. We arrived late to our food pairing demonstration due to our snowshoeing experience going long, but the people at Inniskillin were kind enough to slot us into another tasting. While we waited for the previous tour to end, we enjoyed a sampling of the ice wine discovery pass. 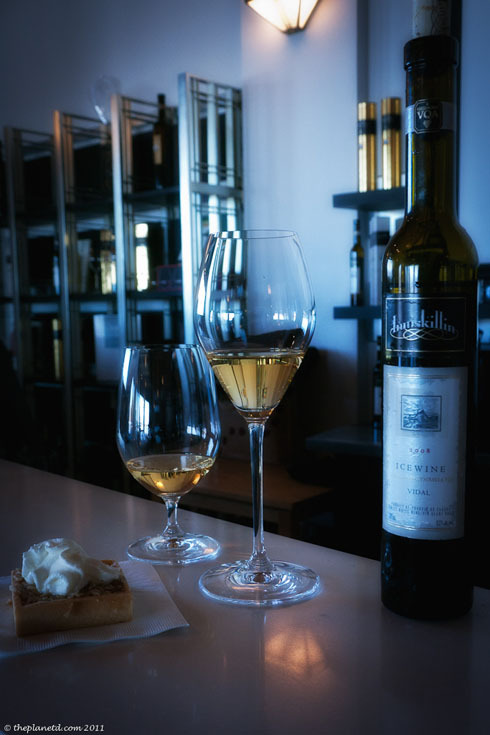 Accompanied by a delicious warm apple tart the internationally acclaimed 2007 Vidal Icewine was served in the signature Riedel ice wine glass. Pam and our server assured us that that glass makes the difference and as skeptical as I was, I gave it a try. We first tasted the ice wine in a regular old wine glass and it tasted sweet and tangy at the front of my tongue. However, once I learned how to swirl it in the Riedel glass, and take a good sniff of the nose before sipping, I actually enjoyed the taste. The wine was smooth and delicious. This is such a great event that we highly recommend adding to your wine tasting. With the discovery pass, it is only an extra $10 and the meal is divine. 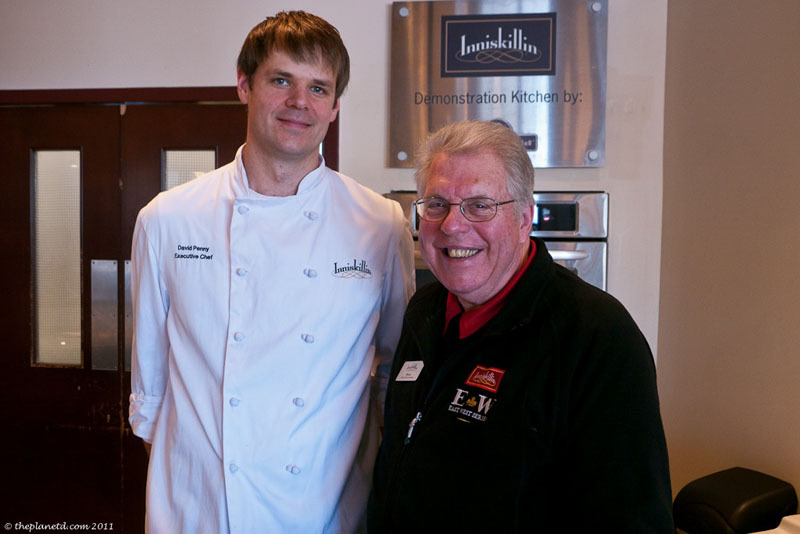 To book your own demonstration, visit the Inniskillin website. 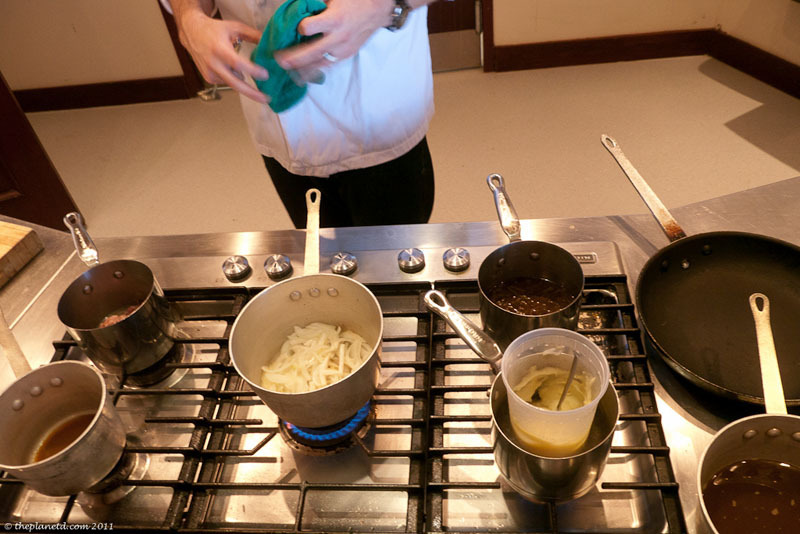 I thought we were going to be fed some pre-prepared food, but to our surprise, it was all cooked in front of us as the chef explained how to prepare each dish. 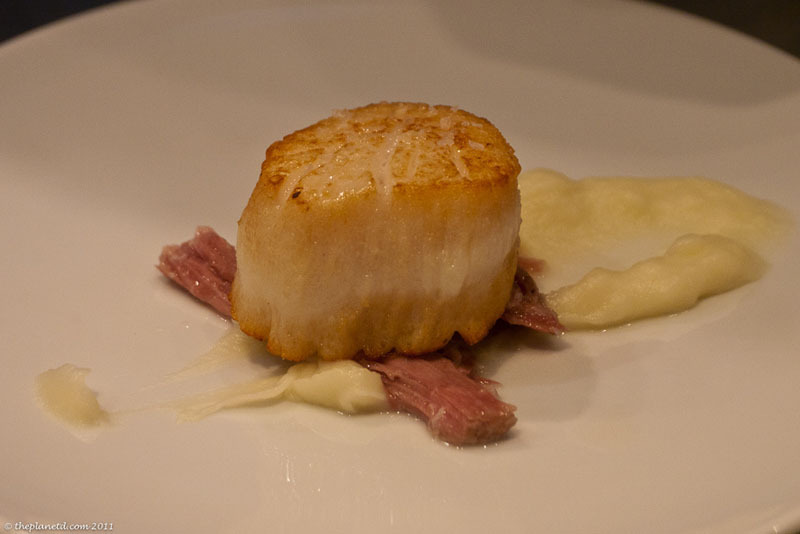 When we saw the giant scallops sitting on the counter, we knew we were in for a treat. Chef, David Penny and wine expert Bruce Jackson put on a great show talking to us about how to prepare the food and what wines complement each dish. Their presentation was informative and entertaining. As a non foodie, (I love to eat it, but I'm not an expert on cooking or fine dining) my interest was kept throughout the entire presentation and I couldn't wait to dig in. I learned a lot as well. Chef David made it all look so easy, I almost thought that I could re-create this at home. I knew that my Dave could for sure and I look forward to him whipping up this meal for me in the future. I am blessed with a husband that is an awesome cook. Not only is he great in the kitchen, he enjoys cooking as well. Yes, I really do have the perfect man. Our sample consisted of scallops atop a heap of pulled pork shoulder sitting on a creamy butter sauce. I don't think I have ever tasted such a delicious dish. It all simply melted in your mouth and the pairing of the ice wine was perfection. I'd take a bite, enjoy and then have a sip of wine and enjoy that. I couldn't decide what I was enjoying more, the ice wine or the scallops and pork. Heavenly. After topping it all off with home made French onion soup, I realized that Pam was right. I did love ice wine. Especially when it is paired with savoury foods as opposed to desserts. The ice wine complements the flavours of rich and delicious foods much better than having a sweet, chocolaty dessert. I actually think that I will buy a bottle of this stuff and enjoy a glass every once in a while. After we finished our tasting we went for a tour of the cellar where we learned even more about the wines of Inniskillin. This day was so decadent that I had visions of quitting everything and becoming a sommelier. However, I was quickly snapped back into reality when we sat down for a nose test. 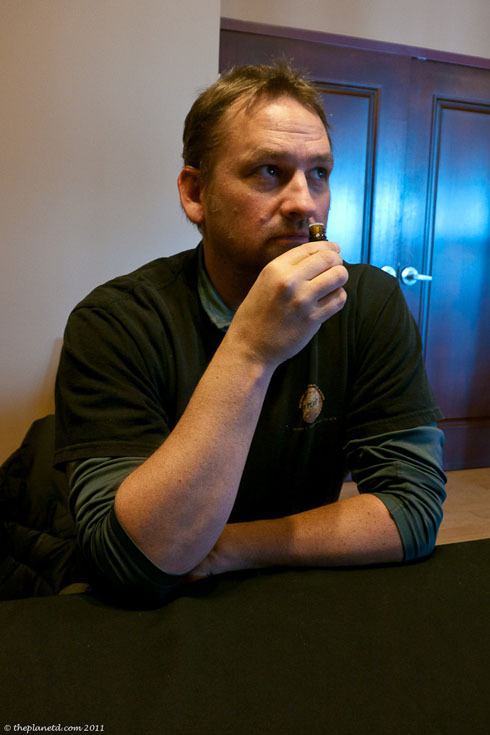 We each took a sniff of the aromas in a bottle and I realized that I don't have a nose at all. Dave on the other hand is a rock star. I always knew that he could sniff the nose of a glass of wine like a pro, and today he proved it. While Pam and I sat in our chairs wondering what the smell reminded us of, Dave confidently took one sniff of the extract and knew exactly what he was smelling. He said his answer with confidence and was right! Could a vineyard be in our future? The tour ended with a walk outside to look at the frozen grapes still on the vines. 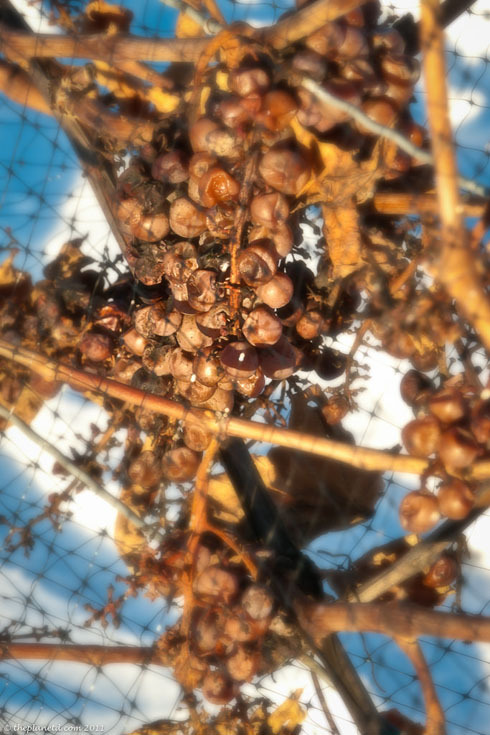 Ice wine is harvested in the middle of the night in the middle of January. Ice wine is literally harvested in ice. Once the grapes are properly froze, they are picked in the middle of the night. It's a lovely addition to the experience to see the grapes still on the vines. 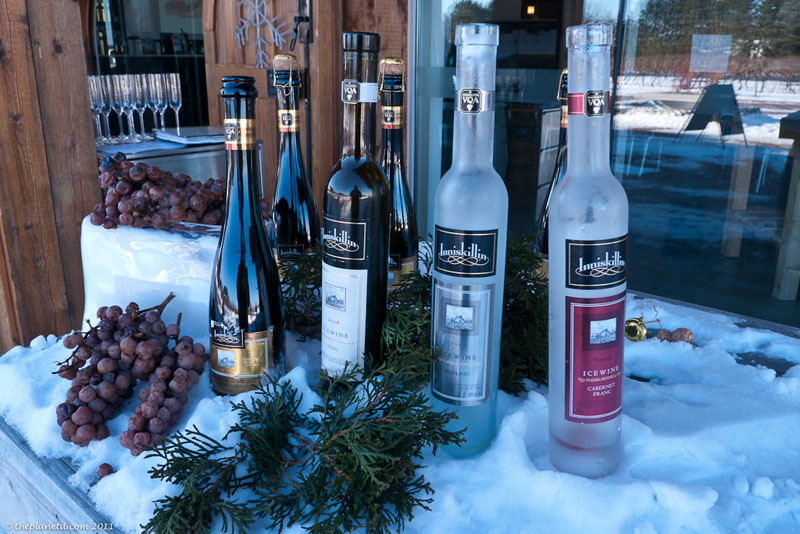 The winery keeps the first four rows of grapes on the vines until the end of the ice wine festival giving visitors a first hand look at the process. Another lovely touch was the ice bar outside just waiting for wine lovers pose for a truly memorable photo opportunity. The Ice Wine Festival definitely made an ice wine lover out of me. 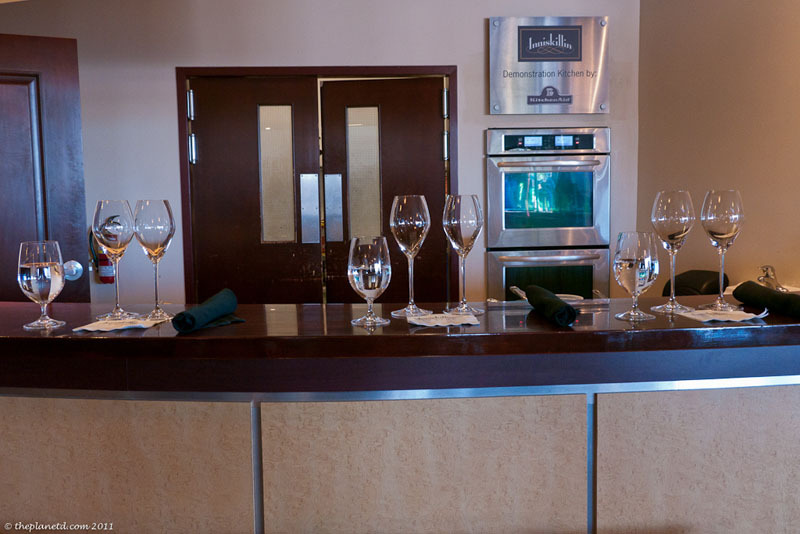 For event information at Inniskillin check out their calendar here. 13 Responses to "Niagara Ice Wine Festival"
Bruce, I am so sorry. I knew your name too. I must have been having a brain lapse. We have our video coming out in a few days and I even introduce you as Bruce Jackson so I don’t know where my head was when I put up the photograph. Big apologies, but I have corrected it. Thank you very much for your hospitality, we had an amazing time. Mwahahahaha I have converted you! Part one of my plan to take over the world using ice wine is complete. I’m glad you liked it! It was definitely a fun day. David Penny is an amazing Chef. If Inniskillin had a restaurant, I’d have reservations for once a month. That’s a great idea, Inniskillin needs a restaurant. Thanks for bringing us along, it was great to discover these amazing ice wines. That meal looks delicious!! I love wine but have often thought ice wine to be too sweet. I like the idea of the savoury pairing – maybe that’s what’s been missing. I felt the same way too. 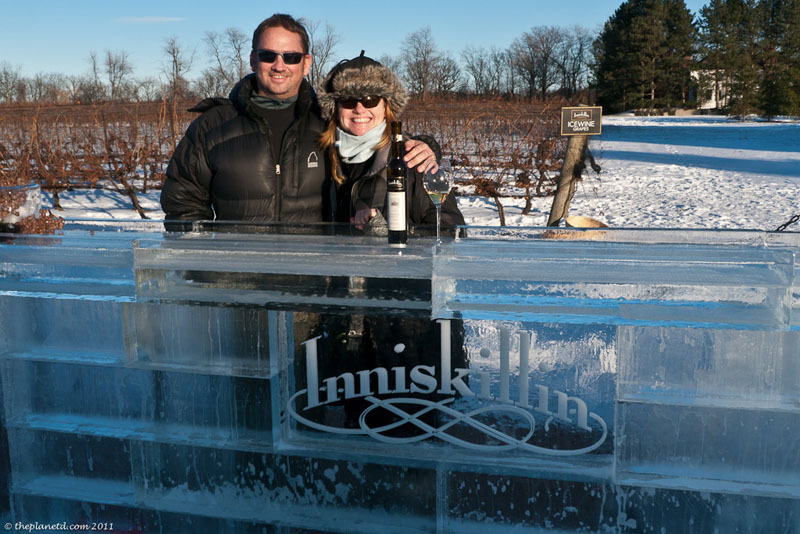 I’m not sure if I have tasted the wrong ice wine before or if the glass really does make all the difference, but we really enjoyed the taste at Inniskillin. I think that the food pairings make all the difference too. Whatever it is, I am a fan now. I think that you have to give it another try for sure. I didn’t think I could be converted, but I was. What a fun experience! I LOVE ice wine!!! Ahh,so glad to hear that you are a fan and it was a fun day. It is such a unique experience to do all of these wine tastings in a winter wonderland. 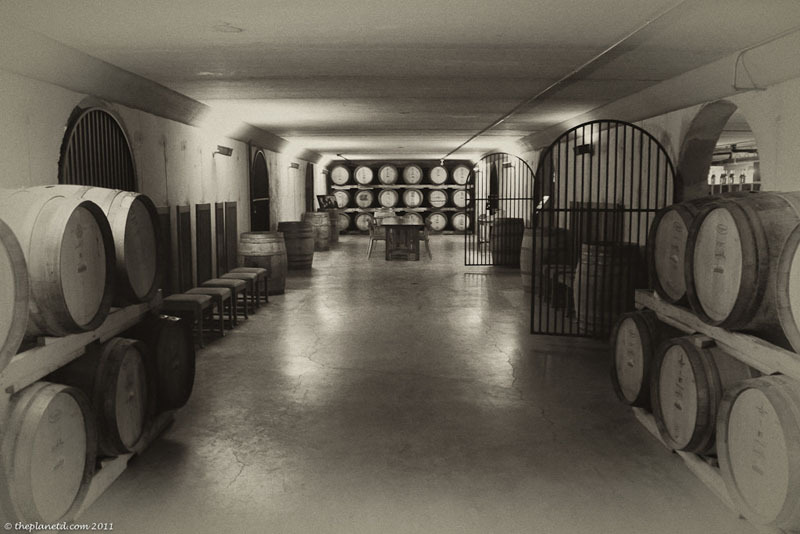 Great post on another of Niagara’s fine wineries.